The weathermen are calling for apocalyptic weather, or something. Frankly, I'd rather just read some Hawkman comics. Black Lantern Green Arrow #30 -- Well, DC has finally succeeded in getting me to purchase an issue of Green Arrow. I don't know if Hawkman will pop up in this but hey, it's a possibility, right? I don't have much against Green Arrow, I just never really thought he was all that interesting. Maybe I will challenge Adama to make me change my mind. In any event, this tie-in sounds like it sheds some light on the mindset of the heroes under Nekron's thrall, so it would give some insight into Carter and Kendra if nothing else. Blackest Night #7 -- The big one. The Hawks make a cameo appearance here, but the story is the big thing, as the conclusion and fallout of Blackest Night shapes Brightest Day as well as the potential return of the Hawks to the land of the living. 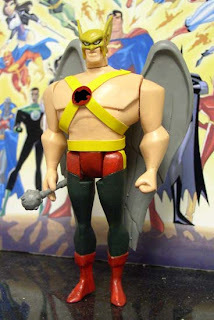 I know that there is an official Justice League Unlimited Hawkman, but I like this custom quite a bit. For one thing, the wing harness and chest piece are not just painted on, which is my main complaint with the actual toy. The Honor Wings are handled very well as well (they are made from cardboard, believe it or not), and the face looks a lot more like the cartoon model. You can check out this page for more Hawk pictures (about 1/3rd of the way down) as well as plenty of other custom JLU-style customs. Very neat stuff! Image: Custom JLU Hawkman by Glassman, 2009, image retrieved from Action Figure Insider. Hey folks, posting is going to be suspended for a little while because my infant son is sick. I'll pick back up next week but right now my mind is preoccupied. Sorry for any inconvenience. Summary: During the Blackest Night, Ray Palmer is conscripted into the Indigo Tribe for his ability to feel great compassion. His new status comes to the front quickly, as the tribal leader Indigo-1 tells him that she intends to contact the rest of the Lantern Corps in order to bring reinforcements to Earth. However, she needs to concentrate and meditate, and Ray has to keep her alive. Ray is assaulted by the Black Lantern versions of Hawkman and Hawkgirl, who taunt him by saying that their lives were defined by death, not love. Ray resists, and is able to tap into the power of an Orange Lantern (it sounds like Larfleeze), and creates Orange Light constructs to battle the undead Winged Wonders, shouting "I WANT MY FRIENDS BACK!" His success is short-lived, however, as Black Lantern Jean Loring soon arrives, and shrinks into Indigo-1's ring. Ray follows after, only to find himself in the Dibney's kitchen, reliving the murder of Sue Dibney. Jean then summons a swarm of Black Lantern Morlaidhans (the tiny race Ray joined during Sword Of The Atom), who pin him down and attack him. Facing his demons of his relationship with ex-wife, Ray taps into the power of a Green Lantern and destroys the Black Lantern Jean. Indigo-1 has managed to summon the various corps, while Ray tells her to keep his involvement quiet, since he likes to keep a low profile. He then asks her a favor: to help him figure out how to bring Hawkman and Hawkgirl back to life. Review: Despite the title, this really is an Atom comic. I suppose I should have let The Mighty Mite handle it? But Hawkman and Hawkgirl factor heavily into the preceedings, and Atom is one of the true blue (and red) Friends Of Hawkman, so here we are. I like The Atom and this story did a good job of demonstrating that he can do more than think and shrink. The taunts volleyed at him about hiding from life, never getting over Jean, wanting what the Hawks had, and so forth, ring very true, so that by the point that he stands up to Jean and takes some semblance of control back, the reader has invested enough into him that you feel his exhileration. It's a well put together tie-in, which is neither gratitous nor transparent. Anyways, As I have already taken the hook on Blackest Night, this was something of a no-brainer for me. Geoff Johns delivers a tale which sets the ball rolling to rectify Ray's personal demons and begin the healing process. Sook and Pasarin split the art duties, and while the split is somewhat noticeable, I dig both of their styles so I am more than okay with. Would I have liked more Hawkman? Yes, but this is one heck of an Atom story and hopefully Johns has more in store for both the Titan and the Fury. What do you say, DC? The Atom And Hawkman as a $3.99 double feature? Image: The Atom And Hawkman #46, 2010, Ryan Sook. When you think of buddy teams in comic books, you normally think of... Wonder Man and The Beast! Err. Wait. Okay, in DC Comics, when you think of buddy teams, you think of... Blue Beetle and Booster Gold! Hrrm. Alright. I got it now. When you think of buddy teams in the original run of the Justice League, you no doubt think of... Green Lantern and Green Arrow! Yeesh. Today's my day off. I tried. Just head over to the new and super-spiffy Atom: The Mighty Mite blog, run by Frank, the man who also knows way too much about the Martian Manhunter. No doubt there'll be plenty of shrinking-and-science action over there, the new online home for the only superhero awesome enough to hangout on Hawkman's shoulder! Shag over at Firestorm Fan posted some very cool pictures of the Firestorm "Blammoid!" toy. And what to my wonderous eyes should appear but what looks like the first hint of a possible Hawkman Blammoid?! I've circled him in the picture above, down in Series 4. Sure looks like Hawkman to me! Image: Blammoids! cardback, 2010, image obtained from Firestorm Fan. Wow, sometimes you want to post something and you just never get the chance. Two weekends ago, January the 30th, was the Big Annual Sale at my local comic shop, Borderlands. And despite the sleet, snow, and freezing rain, I, Adama, and non-blogger Joe braved the elements to take part in the sale. Part of the Big Annual Sale is that all of the dollar bin comics are 3/$1.00. This is usually my big draw, and while I was in fact buying some gaming stuff this year, it was no different. So after grabbing the models I needed, I slid on up to the first of the long boxes and started flipping. I say "started" because I soon stopped. About 3 comics into the bin, I found Hawkworld #1, from the prestige format mini. Needless to say I was flabbergasted. I had looked at, you know, actual Cons for this book and had found nothing. So pulling it out of the discount bin at the Big Annual Sale was just mindblowing. Then I found, right behind it, issues #2 and #3. In one fell swoop, for one dollar, I had the entire Hawkworld miniseries. And in downright gorgeous shape. This, folks, is why no matter how easy it is to order your back issues online or whatnot, why there is still a large swath of comic collectors who live for this sort of stuff. For discount bin diving, Con hunting, scouring back issue bins. And now, thanks to my happening to pick that particular bin to start with, I've made a big step in finishing off my Hawkman punchlist. All I have left to say is "I'd buy that for a dollar!" Summary: In Metropolis, Chloe Sullivan is ambushed by a man carrying a strange golden staff named Sylvester. He claims to be her friend, but winds up being attacked and murdered by an ice-weilding metahuman. Chloe and Clark's investigation turns up that Sylvester was part of a group of criminals who were rounded up many years ago. After another member of the group, Wesley Dodds, is murdered in the same manner, with the letters "JSA" written in blood, Clark begins to dig deeper. He winds up at an old museum run by a man named Carter Hall, who angrily rebuffs the young man, but not before he spots the babbling, seemingly insane man named Kent Nelson. More searching and digging eventually reveals the group of criminals to be anything but: they were a team of heroes called the Justice Society of America, who were railroaded by a government agency and charged with fabricated crimes. Hawkman, the JSA's leader, is not impressed with the current crop of heroes (including Green Arrow, whom he tosses around without much effort), but Kent Nelson -- wearing the Helm of Nabu and becoming the mystical and mysterious Dr. Fate -- says that Kent has a great destiny before him. 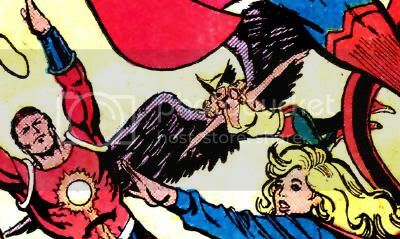 Soon, Clark and his allies (Chloe, Green Arrow, and Detective John Jones) are allied with the JSA (Hawkman, Dr. Fate, and Courtney Whitmore, AKA Stargirl, Sylvester's protege) to find and stop the icy murderer, the son of the original Icicle. The young Icicle is working for the mysterious Checkmate organization, tasked with getting revenge on the Society for putting his father in a coma. Meanwhile, Lois Lane has received a package from an anonymous source detailing the history and cover up of the JSA, which interests Tess Mercer -- president of Luthorcorp -- greatly. Lois pounds the pavement on the story, eventually learning about the JSA's true history as well as the villians they fought. She eventually runs into Dr. Fate, who tells her that her destiny is intertwined with "his," and that she will be very important in "his" life, and "he" in hers. The team splits up to find Icicle. Hawkman and Green Arrow bicker and snipe at each other constantly, while Stargirl explains to Chloe how the Society truly is like a family. Dr. Fate and Det. Jones are ambushed by the Icicle, and Fate is fatally stabbed, but not before he is able to restore Jones' Martian powers. Taking the helmet, Icicle attacks all of the heroes in the Watchtower, but is turned back by a combination of their powers and retreats. Later, Lois has gotten the front page of the Planet for her expose about the Justice Society, and Clark lets her know how proud he is of her accomplishments. Lois then coyly comments about what Dr. Fate told her about her destiny. Clark later asks Hawkman if he is going to put the wings away for good, and Carter tells him that instead he is going to start the Society up again, to train the proteges and children of the original members. Back at Checkmate HQ, Agent Amanda Waller confronts Icicle on his failure, saying that they are going to need an army to fight "the coming apocalypse." Despite his protestations, Waller puts a bullet in Icicle's brain, telling him "Welcome to the Suicide Squad." Outside of Icicle's cell, Waller is pleased to see the return of one of her agents: Tess Mercer. Review: Let me preface this by saying that my wife and I have watched Smallville from the start, and that I own all of the season sets on DVD save for season 8, which I have not picked up yet. So any of the Smallville continuity and history is acceptable to me. Your mileage may vary. So, as a Smallville fan and as a JSA fan, this telefilm wins on both levels. It's a huge piece of Smallville world building and historical expansion, plus establishing some juicy new subplots. And then on the flipside, we see countless bits and pieces of JSA memorabilia on display, from Flash's helmet to GL's lantern to Mr. Terrific's belt and everything in between. Handled by Johns, the voices of all of the characters -- even the Smallville-exclusive ones like Chloe and Tess -- sound absolutely true. The interactions between the JSA and the makeshift League were fantastic. Dr. Fate's turn as a sort of mix of the Doctor and Johns's Starman was very nice. The portrayls of Nelson and Fate were so night and day, but still believable. The method of how his powers were portrayed was excellently realized as well. Courtney Whitmore was absolutely embodied by Britt Irvin. From her beaming smile and the way she talked about her family straight down to the way she wielded the Cosmic Rod, she was Stargirl. Fanboys will complain that Waller was not played by CCH Pounder, but I think Pam Grier did a good job with a small role. I am sure we will see more of her. And Wesley Macinnes was menacing as the young Icicle, even if not much of a physical threat. It was very cool to see a relatively minor badguy played with so much gravitas. And it was great to see Phil Morris back as the Manhunter, especially with his new "green shirt with two red gun straps" costume! As Carter Hall, Michael Shanks was equal parts angry, intelligent, driven, guilt-ridden, and demanding. I really believed his anger at the turn of events which lead the Society to break up, and his concern for his friend Kent Nelson. Johns deftly brought in Carter's history and past lives without harping on it, including the well-used mentions of Shiera and their shared destinies. And the clashes between him and Green Arrow were great! "Green Punching Bag" indeed! The costume was a mixed bag, looking very good at points, but a little clunky at others, but overall I thought he was a good realization of an admittedly difficult to adapt look. I have to say that I am very impressed with how the Smallville crewed pulled off the Winged Wonder and really hope that we see him crop up again. Maybe for that "coming apocalypse" (...Apokalips?) which Waller referred to? Now the negatives, and they're aren't many: couldn't we have gotten cameos from the "other super villians" Lois mentions in her digging? And what about the other members of the "Justice League," such as Impulse, Aquaman, Cyborg, and Black Canary? I understand that there is a limited budget here, but those elements would have been nice to see. But beyond that, I don't have many complaints. Overall, one heck of a Smallville event, and a heck of a lot of fun TV for a Hawkfan! 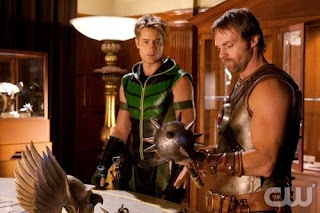 Image: Hawkman and Green Arrow, Smallville "Absolute Justice," 2010, image retrieved from Comic Book Resrouces. Another day, another piece of Smallville hype! This one comes from Newsarama, and is an interview with Executive Producer Brian Peterson and co-director Glen Winter. The piece talks about how the telefilm fits with the rest of the season, the challenges in adapting the Justice Society, and makes the first mention of the villian of the special, Icicle. "It was really hard when you have a guy with wings flying or swooping down," agrees Winter. "I got to tease a lot so I got to show Hawkman's outfit revealing itself for the first time in a giant cabinet. We could do things with lighting and camera movement to really tease the audience." Smallville "Absolute Justice" airs February 5th at 8 PM EST on The CW. As the countdown to Smallville's "Absolute Justice" continues, DC's The Source has posted this preview video, which can be seen here at Newsarama. Oh man, watching this past week's episode with Green Arrow and the Dark Archer really got me back into the mood for Smallville. The only downside is that I am going to be out of town on Friday and have to watch this one on tape! Arrrgh! The Atom made his way to the lab of an associate, Dr. Will Magnus, and put together a teleconference relay that could seek out any Thanagarian vessels near Earth. To his surprise, he was able to almost immediately connect to Hawkman and Hawkwoman, alien policemen and his closest friends in the super-hero community. Normally, the Tiny Titan could travel over such signals as telephone broadcasts to reach a distant destination. However, between the vagueries of Thanagarian technology and the warning Hal Jordan gave him, he dare not make such an attempt at this time. "I... I thought you guys were on leave." Hawkgirl replied, "We are, but we still patrol the Earth from--" Before she could continue, Hawkman shushed her tersely. "Any information you give him-- they'll know." Ray reconsidered Hal's warning that the Hawks had become unstable. This paranoia and history of recent violence against fellow super-heroes wasn't helping. Still, the Atom needed a friend right about now. "Look Carter-- everything seems to be going crazy these days, and I think it's all my fault. I was working on this experiment, when I was attacked by the Martian Manhunter..."
Hawkgirl blurted, "You too?" Hawkman again gave her the stink eye. Suddenly, both the Hawks grabbed their temples and doubled over in psychic pain. "...Captain Comet... trying to... contact ...us..." Again, the Atom feared for the Hawks' mental state. "Katar, we have to help him." "Shayera, he's another human. We can't risk it." "I don't take orders from you, mister! I'm not about to desert a hero in his hour of need. I'm going to Los Angeles to help him." "Katar Hol-- you just try to stand in my way!" "Damn it, Carter! Get off your high horse and help us out here!" Through a clenched jaw, Hawkman growled, "I don't ride horses, Atom." There was a moment of heavy silence, until Shayera let loose a snort, which set Ray to laughing. Once Hawkgirl got over the giggles herself, she said flatly, "Katar, I'm flying the ship to L.A. I'll drop you off near Ivy Town along the way." "I'm at Will Magnus' lab, actually." "Fine. I think I know roughly where that is." Katar scowled, "Don't I get a say in this?" Shayera smirked, "Not really, no." 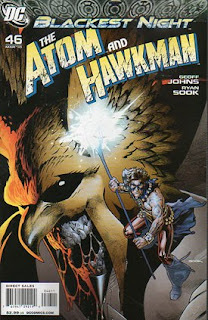 Follow Hawkman and the Atom? Follow the rest of the DC Challengers in this "Crisis On Earth-Blog"
Welcome to the DC Challenge... hope you survive the experience! 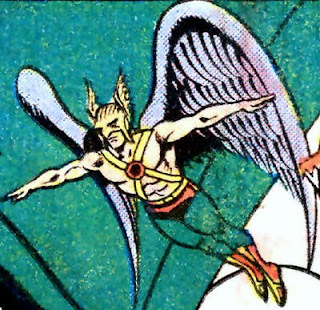 While Hawkman has been a member of the Justice League of America since the Silver Age, but his relationship with the team has not always been smooth. During a shadowy, secret invasion of Earth by a team of rogue Thanagarians, Hawkman and Hawkwoman were forced to fight the JLA. Which founding member of the Justice League was felled by the Hawks -- without the Winged Wonders having to throw a single punch? For more DC Challenge fun featuring the Winged Wonders, click here!